So, the other day, Growing Up Disney celebrated their first anniversary. I want to first congratulate them, as I know how much work and dedication goes into this endeavor. And also how much Love you have to have to continue doing it. I have been fortunate enough to have met Amy and Ridge, if only online and have had the honor to write a guest post (or two) for this wonderful website in the past. When Amy asked for another guest post, I knew exactly what I was going to write about; the name of this website; Growing Up Disney. I didn’t have that Disney experience. We did go twice to Disney World when I was a kid. I was 12 and 14 when we went; Epcot wasn’t even open yet. I fell in love with the most magical place in the world on those trips. I went back on my senior trip in high school in 1985, then got back again in 1990. It would be another decade before I made it again. That is when I realized I couldn’t live without going every couple of years. I needed to go to Disney World, so I bought in to the Disney Vacation Club. 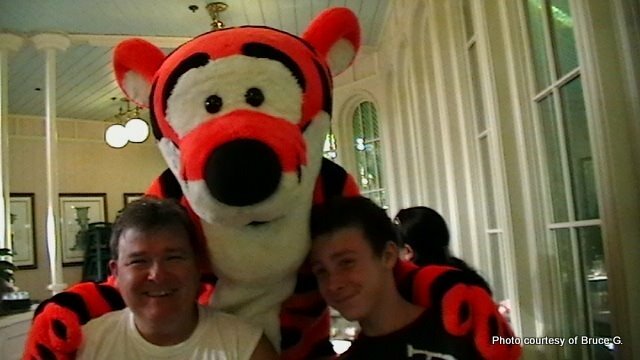 Because of that, my son, John, hasn’t gone more than two years without going to Disney World since he has been eight (that was when we took our first trip as a family. You can read about it on this site.) So, I consider that he has been Growing Up Disney. He has undergone many changes, since then; he is 15 now, a true teenage boy, and you can see that in his room (which I try not to look at). But when it comes to Disney, he is still the same kid that got excited about driving the Tomorrowland Indy Speedway car by himself. He has his favorites as we all do, but if we don’t get to them, he doesn’t pout like he did years ago, because he knows it is only a matter of time, before we will be back again. His favorites have changed a little over the years. He still likes the attractions, and although we haven’t driven the Indy cars in years, (I think they are a little too slow for him) he still likes the cars. Test Track is in his top five favorites, as is Expedition Everest. He has made me go on Mission Space with him a few times and he really enjoys Toy Story Mania and Buzz Lightyear’s Space Ranger Spin; I think that’s because he competes against his mother and I. I don’t think he really likes some of the attractions that we go to, The Country Bears and Mickey’s Philharmagic for example, but he is good about humoring us and not being much of a teenager when we are in Disney. John’s favorites now are more of the non-attraction variety: The Boardwalk, Winter Summerland mini-golf, Downtown Disney and of course the FOOD! John helps me write an article on Tuesdays on my website called Tips from a Teenager Tuesday. Every week I ask him to tell me something that everyone should know about in Disney World. The first article we wrote together was called Food, Food, Food. Most weeks he wants to talk about another restaurant, but I keep putting him off. His food favorites are varied. 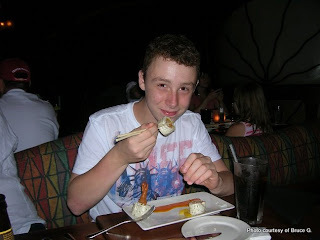 He really likes Le Cellier and the Nine Dragons (He loves Chinese food) and he enjoyed when we ate at Teppan Edo, the Japanese Restaurant in Epcot, but he also includes in his top five the Pepper Market in the Coronado Springs Resort and Big River Brewing, on the Boardwalk. He likes these for the different choices they give him and in the case of Big River, the burgers. 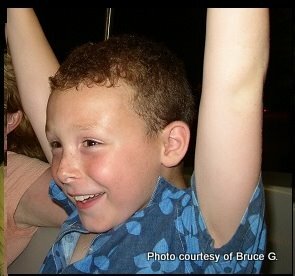 It is very cool, to travel with him to Disney World now, not that it wasn’t when he was younger, but then he wouldn’t share with us what he wanted to do, as kids sometimes do, and then when we couldn’t read his mind, he’d be disappointed. Now it is much easier. He’ll either tell us what he wants to do, or where he would like to eat or he just tells us he’d rather not go. When we were down last summer with our friends, John and his friend decided they wanted a night in. It was funny, two 15 year old boys not wanting to go out at night in Disney World. But they both were tired and in need of some down time, so they stayed in and watched our friends’ little girl and the four of us went out for the evening to a nice dinner and a stroll of Downtown Disney. If John hadn’t been Growing Up Disney this whole time, I don’t think he would have stayed in, he would have forced himself to go out and then the next day he would have been even more tired, which in turn would have probably made him grumpy. And the best part is, he still gets excited about going to Disney World and still wants to go. What is funny is that I know some kids whose parents guide them in a certain direction when they are young. I have a friend whose siblings all attended a major university, because they grew up being brainwashed, by their dad, to go there. I remember my friend’s sister threatening that she wasn’t going to go to that university, once when she was having a fight with her parents. I have seen this with other things also, but I don’t force John to like Disney, I don’t make him sit and watch Disney movies with us or discuss what is happening in Disney World, but sometimes he does sit with us and watch a Disney movie and sometimes he does bring up the Fantasyland expansion, but he does it on his own. I think it is because, even though it isn’t cool as a fifteen year old, Disney is in his blood. Not just because of the Disney objects we have around the house, but because he has been Growing Up Disney. 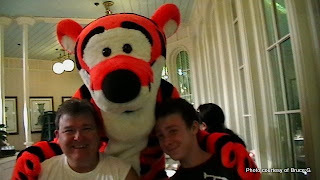 And I hope that like Amy and Chris, John will look back on these family trips and the things we did in Disney World with happy memories of great family times and I hope that when he has kids I can be like DisneyDad and enjoy walking them up Main Street USA. Contributed by Bruce G., husband to Heather, proud father of John, and creator of The Unknown Magic Within Walt Disney World. Great article, Bruce! I think we have very similar experiences in that I didn't make my way to WDW until I was 13, but my kids have gone every other year since they were born. I feel lucky that my kids love Disney because I didn't force any of it on them. 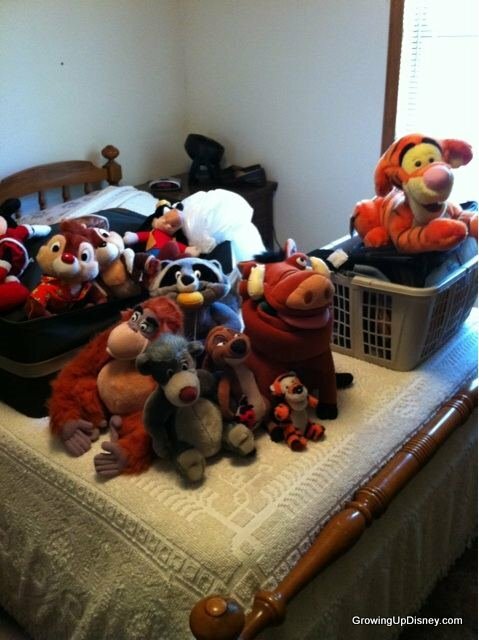 We have lots of Disney things around the house, but we also have plenty of other favorite characters too. Other than my Disney books from childhood, I didn't grow up Disney, but I know my kids are in their own way. I've told Amy this before, but I just love the basis of her site - family and Disney. Even today as a mom of three, we still travel with my parents. It is a family experience for us and I look forward to seeing my children discover new favorites each trip and feel blessed my parents are there to share those moments with us. Excellent post! I hope my kids always love Disney, but like you, I won't force it on them. I'm definitely headed to your blog to follow the Tuesday series. Sounds fun! I enjoyed reading your article, Bruce. Very sweet. 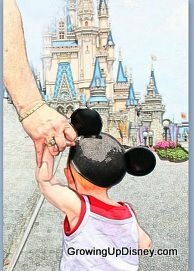 I look forward to having fun in the parks with my kiddos as they get older. I hope they enjoy growing up Disney as much as I did!